A successful Virus Infection in a computer will usually disable the most important built-in Windows utilities such as Regedit, Task Manager, System Restore and others to disallow users from manually removing the virus. If you face this problem now then you'll be needing the help of Re-Enable software. This application was designed to repair the damage caused by Viruses, Malware and Trojans. Instead of reinstalling the Windows just to enable the infected built-in features, you can opt to use this dead-simple tool. 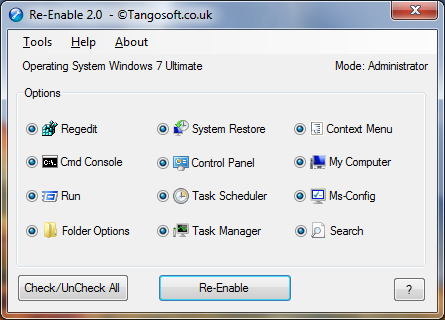 Just Run Re-Enable, check the options you want to enable and hit "Re-Enable" button to reset them. This program is also available as portable application for PC that has no .NET framework installed.